With this new section HistoricHampshire.org is beginning a new phase of archiving the history of West Virginia's oldest county. 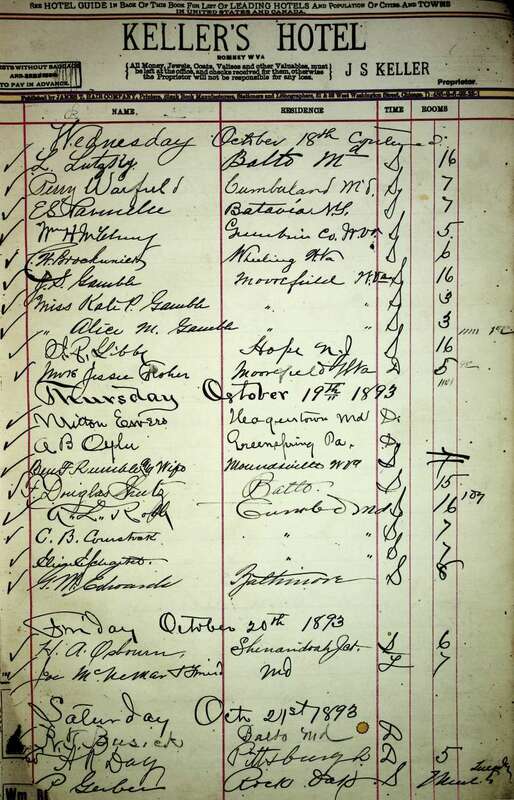 Due to the foresight and generosity of a Louisa Hardy, a descendant of owners of the Keller Hotel, we are presenting here digitized versions of the Keller Hotel register. This wonderful collection gives is an insight into business in Hampshire County and into the prominence of Romney on the Northwestern Turnpike. It shows us how locals from the county in the days of horseback travel and wagons would spend a night or two in Romney on their business trips, and it also shows us how visitors from far away stopped in Romney. Also seen are the traveling salesmen who made use of the hotel's special room where salesmen could set up a display of their wares and carry on business. The images of the hotel register shown on these pages have been edited for web use. We are keeping a higher resolution version for archiving with the West Virginia State archives and other research libraries, but the images here have been edited for fast loading and conservation of space on our internet web server. We would appreciate your comments on the quality of the images. We have two examples for you to see the difference. Click here for the full resolution image (2710x4222pixels). Click here for the web edited version (800x1246pixles). If you have a high resolution computer monitor and high speed internet service you might prefer the larger image, but we must cater to those with less sophisticated equipment and slower internet access. The web version is about one-eighth to one-tenth the size of the version we will place in libraries. We still would appreciate your comments. See the contact page for info on how to contact us. This is a work in progress and discovery. Please check back as we add to our available register pages and expand the history of the hotel. 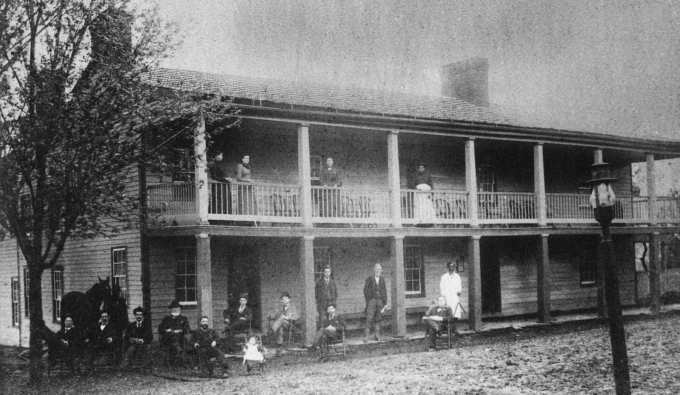 The Keller Hotel in Romney, West Virginia, began as the Armstrong House. After the Civil War the Kellers bought it. It was later changed to the Century Hotel before it was sold in 1913 and then torn down for the New Century Hotel which opened in 1915. To view pages of the Hotel Registers click on the year you are interested in. Please Note: We have, for your convenience, listed the Registers by Year and not by book. The Hotel might run one book from part of one year to part of another year or even skip around. We have organized them for better research. Click on Year below: - Note we are still processing the Register Books so check back. More to come! Check back. by 1834 the Northwestern Pike reached Romney; by 1838 it reached Parkersburg on the western edge of the state. 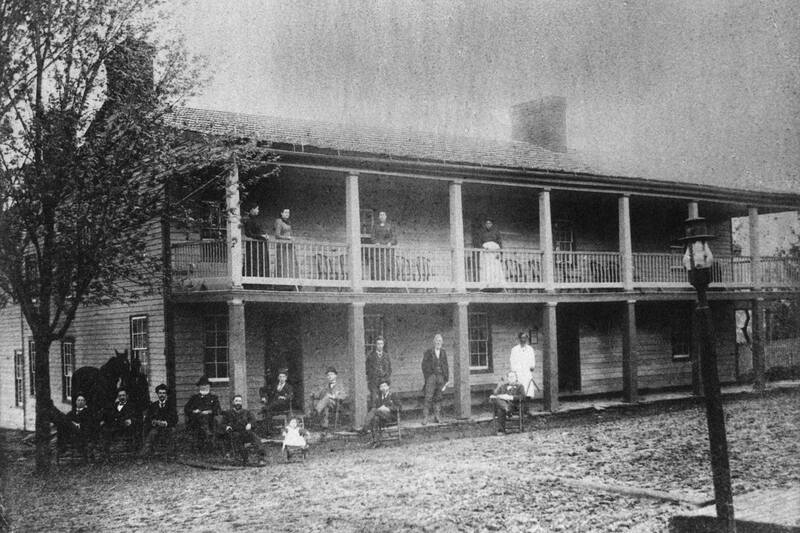 March 6, 1907 J. I. Keller has rented the Keller House to William Hendrickson, formerly of Moorefield, but more recently of Maysville, Grant County. April 3, 1907 Keller's Hotel caught fire Sunday evening and it was only because of the timely discovery of the blaze that there was not a conflagration in the upper end of town. A number of persons were sitting in the office when the blaze was discovered in the kitchen. The blaze was sweeping up the stairway at a furious rate, but by prompt and vigorous efforts it was quickly subdued. September 1913 The old Keller property has been sold to a number of local people. A Modern Hotel [New Century Hotel] to be erected in Romney on site of the Old Century. 2023 HistoricHampshire finally get the Keller Register pages up on the Internet?